Events in Venezuela shook the world on Wednesday, with many left wondering if January 23 was the beginning of the end for the government of President Nicolas Maduro and the beginning of a new chapter of U.S. interventionism. Here are five reasons why it’s unlikely that this latest drama in the South American nation is the “endgame” that the mainstream media is hyping up. 1. “Interim president” … who, what? On Wednesday, amid massive anti-government mobilizations, the U.S. and a number of Latin American states – along with Canada and some regional organizations such as the Organization of American States – all recognized National Assembly leader Juan Guaido’s self-proclamation that he would thereby be the “interim president” of the Bolivarian Republic of Venezuela. A relatively unknown 35-year-old member of the opposition-held National Assembly can’t simply snap his fingers and assume the presidency, even if he has the diplomatic nods of some powerful countries in the region or across the globe. To illustrate the absurdity of the move, a comparison would be like Democrat House Speaker Nancy Pelosi responding to “not my president” chants at a Women’s March by declaring herself “interim President of the United States of America Commander-in-Chief of the U.S. Armed Forces” – with the consecration of Russia, Turkey, Iran and El Salvador. Such a move to recognize an unelected president as the legitimate leader of the country would fly in the face of the Constitution as well as international law – and such is the case in Venezuela as much as it would be in the U.S.
Guaido only entered the fractured world of opposition lawmakers – who’ve seen a carousel of leaders come and go – in 2015, and was only pulled from relative obscurity into the national and international limelight in the past couple months. The man has shown few signs that his declaration of a coup and appeals to the military will be any more successful than the opposition’s many failed attempts to take power since the U.S.-backed coup in 2002. Venezuela remains far from alone on the international arena, and a number of powerful countries have refused to fall in line with the United States-led refusal to recognize elected President Nicolas Maduro as the country’s legitimate leader. Russia, China, Iran, Turkey and regional heavyweight Mexico, as well as a number of other smaller countries, have each signaled that despite the wishful thinking of Maduro’s opponents, business-as-usual will proceed with their Venezuelan counterparts. And while a united position from Europe may have the potential to hedge in Venezuela’s government even more – with Britain, Germany, Spain and EU bureaucrats signaling their support for the opposition – Brussels is yet to make its move official. Such divisions show that Venezuela is nowhere nearly as isolated as the U.S. would like to think. Despite a few flare-ups of rebellion within the ranks of the National Bolivarian Armed Forces, the country’s military leadership remains firmly at the side of President Maduro. Venezuela’s large and very well-armed military will play the decisive role in this drama. It enjoys modern Russian attack helicopters, jets, armor and the latest AK-103 assault rifles from Russia, and in addition to its 120,000-strong armed forces, there are a number of armed militia among the ranks of the citizenry. 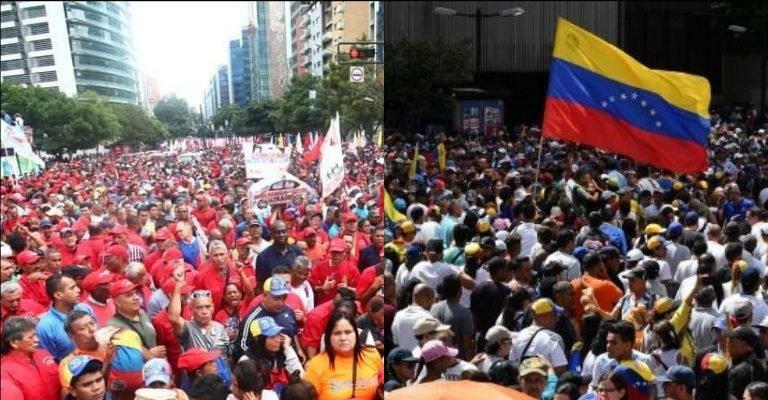 While President Maduro has his detractors in the hundreds of thousands, if not millions, the controversial former bus driver and elected leader has supporters in at least equal numbers, if not more. Were it not for such support, he would have been gone long ago. Yet, through various legal maneuvers, the leader has maintained popular support and has used it to neutralize the massive opposition at every turn and amid skyrocketing inflation and recession. Yet throughout it all, Maduro’s popular touch – and the enthusiasm that the Chavismo brand of socialism continues to inspire among the country’s poor, despite its problems – has allowed his government to win the battle of hearts and minds among some of his most jaded and weary supporters. Despite his flaws, most Venezuelans would never imagine siding with a U.S. threatening war over their own government. If there’s one thing that will unite a fragile and nationalistic country, it’s the aggression of a foreign enemy. After the debacles in Iraq and Afghanistan, is the U.S. really willing to risk a so-called “humanitarian intervention” against a country that’s bristling with arms, is twice the size of Iraq, and whose disintegration would unleash social instability across the hemisphere? The danger of the U.S. stepping into a trap that they can’t escape is real, and Washington hardly has an appetite for such pain – especially not while rivals like China are rising and the world curiously witnesses the ongoing shutdown debacle. And while the U.S. may choose to “lead from behind” and let regional countries like Colombia and Brazil do the fighting, Colombia’s President Ivan Duque has shown little willingness to intervene militarily while the tough-talking new Brazilian leader Jair Bolsonaro appears to be more bluster than bite. The United States may be able to talk big and apply sanctions with reckless disregard for international law, but it remains highly doubtful that it would be willing to incur the military, political or financial costs of an all-out war on the people of Venezuela. Washington must know by now that it’s one thing to start a war, but quite another to finish it.